The Optical Society (OSA) has elected Dr. Ebrahim Karimi as a 2019 Fellow. Dr. Karimi is an Assistant Professor with the Department of Physics and a Canada Research Chair (T2) in Structured Light. 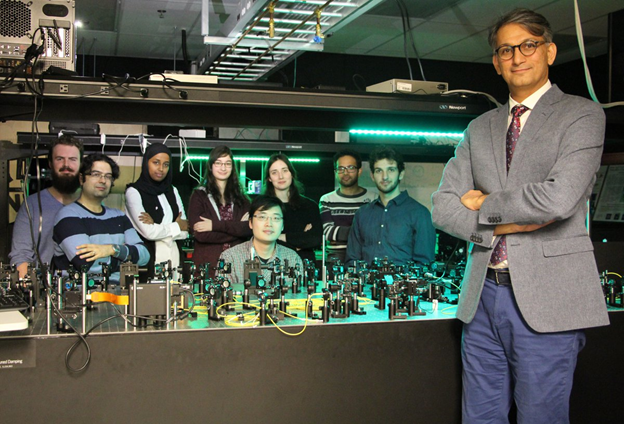 Dr. Karimi is being recognized for “outstanding and sustained contributions to the research and development of structured quantum waves, particularly singular optics, optical angular momentum, and quantum information”. You can read more about Dr. Karimi’s research here. You can view his interview with OSA here. As an OSA Fellow, Dr. Karimi joins a distinguished group of members, including members of the CRPuO, who have served the Society and the optics and photonics community with distinction. Additionally, Dr. Karimi has also been named to the Global Young Academy, a prestigious international group of young academics at the start of their promising careers. The Global Young Academy brings together the world’s top young researchers to serve a five-year term, during which they apply their dedication and excellent research skills to tackling the most pressing global problems. Congratulations, Dr. Karimi, on these well-deserved distinctions!